I really don't understand the issues everyone is having with the Turtles' size. I think the height is great. I've never been a huge fan of the Turtles, but I always assumed they were supposed to be roughly the same height as humans. These things are great and I honestly think they're the perfect height. I guess if you've never been a huge fan of the Turtles, it might not bother you! But the Turtles are generally depicted as being around 5' -- with multiple sources listing them in the 4' range. (By contrast, the tallest stat I can ever recall seeing for them is 5'8" in TMNT: Tournament Fighters -- in which Shredder was 6'6".) So you're right that they're roughly the same height as (some) humans, but they're definitely below average height and shouldn't be as tall as or taller than most superheroes. Granted, there's no law saying that one action figure line has to be consistent (scale-wise) with other unrelated lines, but I always like it when figures integrate well into my existing collection for crossover setups and other fun stuff. 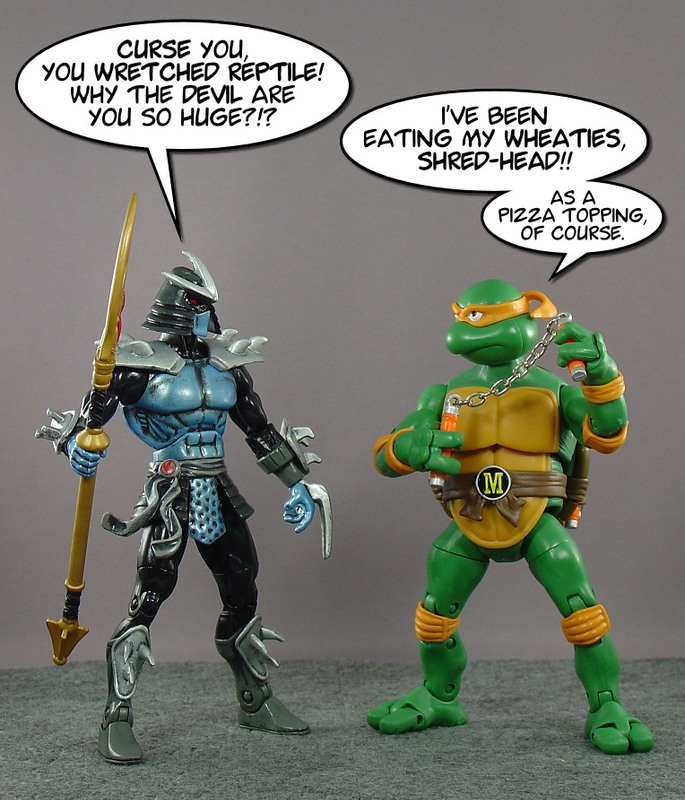 It's also kinda unfortunate since the TMNT classic line at this point consists only of the four Turtles -- and they exist in a scale that precludes them from battling most villains and hanging out with most babes from other figure lines until Playmates gets around to making Shredder and April. The only thing that bothers me is how the letters on their belts are printed so... NEATLY.